Armed offenders squad members were involved in a raid on an Oamaru address this morning. Photo: Hamish MacLean. Police, including armed offenders squad members, swarmed on an Oamaru address this morning as part of a methamphetamine raid. Detective Sergeant Hannah Booth, of Oamaru, said police, including AOS members, carried out the search warrant at the Parsons Rd property. 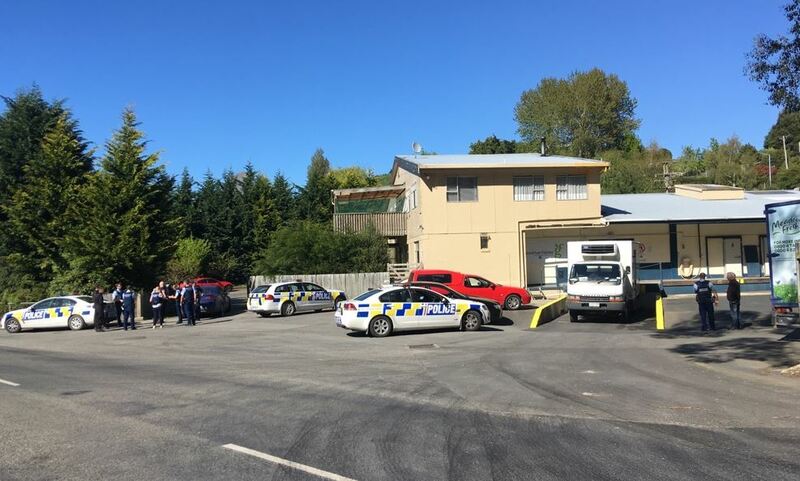 The raid was related to the supply of methamphetamine and connected to the Mongrel Mob, Det Sgt Booth said. She could not comment on this stage on what had been found at the property, a former milk treatment station near the edge of the town. About six patrol cars and a dozen officers were involved. The road was closed for about 90 minutes while the raid took place and reopened about 9.30am. Roads in the Saleyards Rd and Parsons Rd were blocked off. The operation centred on the former milk treatment station. A New Zealand Police spokeswoman said no further details were immediately available.